Summer Glory Index score for June 2016, compared to average, maximum, and minimum values for the month. The results are in, and June 2016, though occasionally quite lovely, was no June 2015. The month ended with 665.7 points on the Summer Glory Index (SGI), making it the 24th nicest June out of 114 on record. This otherwise respectable score is of course nowhere near the record-topping 905.5 points earned by June 2015. So, what was the difference between June 2015 and June 2016? Basically, it all comes down to a handful of less-than-ideal days that last June avoided but that this June fully embraced. For instance, in June 2015 only one calendar day in the Twin Cities reached 90 degrees, and there were no 70-degree-plus low temperatures, no 70-degree-plus evening dew point readings, and no calendar days with at least an inch of precipitation. By contrast, this June had six days with some combination of those conditions, each of which cut into the monthly SGI totals. Even with those six inglorious days, however, this June was still significantly more pleasant than the average June, and was substantially more tolerable than June of 1933, when scorching heatwaves (including 17 days with high temperatures of at least 90 degrees) led to a total of just 56 SGI points for the month! So what does a reasonably-glorious June mean for the rest of the summer? Good question! We don't know. We do see that 9 of 10 Junes that ranked similarly to June 2016 were followed by a noticeably less glorious July, with the median ranking plummeting from 25th to 73rd, and five switching from top-30 to bottom-30. The biggest backslide of all belongs to 1936, which followed its respectable 654 points in June with a genuinely unrespectable -241 points in July, thanks in part to eight days with highs above 100 degrees and seven straight days with low temperatures of 80 degrees or warmer. Eight out of 10 Augusts also faired more poorly than June. It's worth pointing out that we see the opposite behavior for the Junes that ranked near the bottom; conditions generally improved dramatically in July and/or August. All this really tells us is that with some exceptions, Minnesota summers are typically marked by large variations, and that most patterns, whether lovely or despicable, do not persist for the entire season. 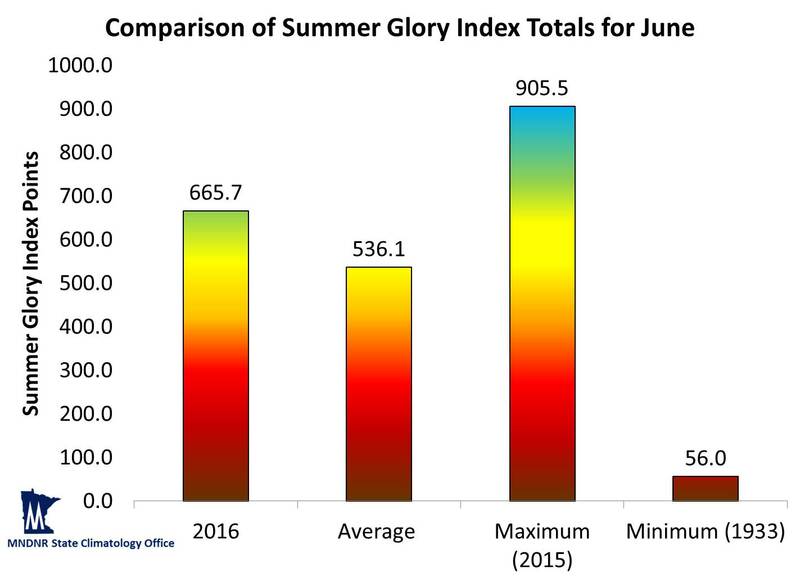 We'll provide Summer Glory Index updates when July ends, and after the close of meteorological summer (which runs June 1 through August 31).